Welcome Fall! There’s nothing more exciting than the change of seasons, and the possibilities of falling in love during fall leading into the holidays. There are endless articles on how to fall in love using words, eyes, flirting gestures, using your sense of humor, but did you know you can fall in love just by staring at someone’s eyes? Once upon a time ago, two people fell in love at first sight just by using their eyes. One of the two, was myself! There was something about this gentleman’s eyes that captured my attention. I kept staring at him and then turning my head away quickly, a bit nervously. When we finally started talking after 20 minutes of staring at each others eyes and smiling, it turned out we had the exact same colored eyes. I wrote about that experience in my first published book and know first-hand that this can actually work. Perhaps I can say we fell in love at first eye-sight. 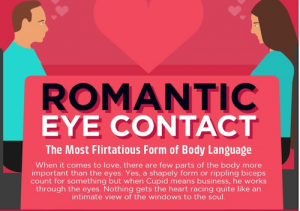 Research has backed up this theory that you can fall in love with someone just through eye contact. Then again, there are songs about eyes, such as, You’re Too Good to be True, Can’t Take My Eyes Off of You, Brown Eyed Girl, Green Eyes Lady, These Eyes, Spanish Eyes, and the list goes on. Research and instinct prove that both men and women are visual. Either the see something shiny or someone attractive that they like, or they don’t. This is why popular dating apps such as Tinder, Bumble, and Hinge are so popular and singles are swiping right in record numbers. At Cyber-Dating Expert, we recommend that you ditch those sunglasses in your online dating profiles and mobile apps, and make sure your potential date can stare into your sparkling eyes. When two people in love gaze into each others’ eyes, their heartbeats synchronize with each other. Your eyes dilate almost 50% wider when you look at someone you love or fancy. When flirting, a woman will look at someone, then quickly look away and wait 30 seconds if she’s interested. Perfect vision makes it easier to fall in love at first sight. Gazing straight into a stranger’s eyes can make them fall in love. Rapid blinking may mean someone is attracted to you. Women will find a man attractive if another woman is looking at smiling at him. When someone who finds you attractive locks eyes with you, they automatically go up a notch on your love barometer. Sparkling eyes show strong emotions. People with a strong connection of love hold eye contact for longer periods of time. Plus 21 more fun facts in this Infographic below. Julie Spira is America’s Top Online Dating Expert and Digital Matchmaker. She was an early adopter of Internet and mobile dating, and has been coaching singles on finding love online for over 20 years.